Pasquale Anthony Leonardo keeps his fingers close to the pulse of the ultimate community, and even closer to his keyboard. He’s a household name (if, that is, you happen to live in a house where at least three discs dating prior to 2007, a UPA bumper sticker, and a subscription to the New Yorker can be found), which is more than most other ultimate semi-celebrities can say. With a pedigree that places him on teams with greats like Ken Dobyns and Ben Usadi, Tony Leonardo recently made trips to nationals and worlds with the Philadelphia masters team OLD SAG and boasts a gold medal won with Team USA (Masters) at the 2011 World Championships of Beach Ultimate. In addition to over three decades of playing the game, Leonardo wrote as a correspondent for the UPA, co-authored Ultimate: The First Four Decades, and is, of course, the mind behind Ultimate: The Greatest Sport Ever Invented by Man, the sport’s closest thing to an instructional manual on how to pick up a date after a league game. Now living and working out of New York as a writer, a freelance sound technician, and a color commentator for the East Coast MLU circuit, Leonardo sat down with me to discuss the publishing of the third edition of his iconic book. 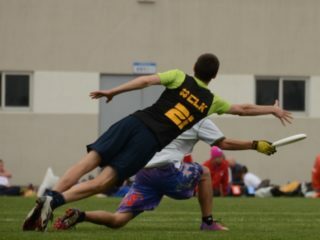 SKYD: I equate reading The Greatest Sport Ever Invented by Man to having a conversation with one of my own teammates: a sarcastic exaggeration of the truth of our surroundings, always centered around ultimate or some inside joke. In regards to your particular writing style, how have ultimate players responded to the book? Have you gotten any responses about the book from folks outside of the tribe? Tony Leonardo: A lot of comments I get are versions of “I read it at my friend’s house and wanted my own copy” and “who did the illustrations? they look just like so-and-so.” Some non-ultimate people have also liked the book but that’s rare. I mean, why would they? By that same token there are plenty of players who probably think the whole thing is juvenile, but that’s because they’re juvenile and they just don’t know it. And also I’m juvenile for calling them juvenile. SKYD: When the second edition of TGSEIBM came out I put my hands up and thought, “This is it. This is the pinnacle of literary sports writing. All future words are useless.” So… why did you go and ruin it by publishing the 3rd edition? TL: Literary sports writing in the humor category is pretty thin, so if TGSEIBM is the pinnacle, that translates to the 129,827th most popular book on Amazon as of January 21, 2015, just so we know where that pinnacle is. I went ahead with the Third Edition because 1) I wanted to bump that number up a few thousands 2) the pro leagues, USAU, and Brodie Smith all made the last edition outdated and 3) boredom? free time? foolishness? Extinction burst? I think the best choice is extinction burst. SKYD: The pictures and some of the descriptions of team or player types seem way too eerie to be a coincidence. Who were your ultimate muses back during the inception of this book? What new sources of inspiration have you drawn from the ultimate scene for this new edition? TL: The book’s illustrator, Cade Beaulieu, was sent to me from an RSD post I wrote looking for an illustrator. He played ultimate up in the Boston area and a lot of the drawings come from his creative mind. As part of the book process I also sent Cade photos I had and asked him to make illustrations based on the photos. The illustrations themselves (and the book as whole) were stylized akin to The Hipster Handbook, a jokey guidebook to the culture of hipsters in Williamsburg, Brooklyn, which was in turn based on The Official Preppy Handbook from 1980. As for the descriptions… The Oddball is a combination of Ben Usadi, The Gata and Doug Stenclik. The Partier is Lucas Murphy (at least the illustration is actually from a photo of him) but is equally based on a bunch of different partiers. The Athlete was Becca Tucker I think? Maybe Kim Tischler a bit? I can’t quite remember. The Rec Leaguer could be anyone. The Permanent Grad Student was based on what seemed like all these Boston players I kept matching up against. The Local Oldster is part John Garb, part Eric “E” Koch, my original big man mentor from South Bend, and a discussion I had one year at Turkey Bowl with an aging but still damn good Skip Kuhn. I’m pretty sure my co-pilot Jane Carlen wrote most of the Engineer, or at least had the insight on that one as well as the Permanent Grad Student. Needless to say, the year I wrote this with Jane (and her friends Katie Derickson and Chris Cline from Philly) I was traveling and playing with the legendary Bashing Piñatas. All those dudes and dudettes were characters who made it into the book in some way. Lastly, the new edition was inspired by equal parts Sub Zero in their tights, the Ghetto Birds (who at Potlatch two years ago married my child’s mother and me in a mock ceremony), and Everything Ultimate. SKYD: In your opinion, what does this book satisfy in the ultimate community? Do you think this has changed since the original publication eight years ago? TL: Honestly I don’t have an answer to this one. I don’t really know what effect it’s had on the ultimate community at large. I hope it’s been a good one if it’s any at all. 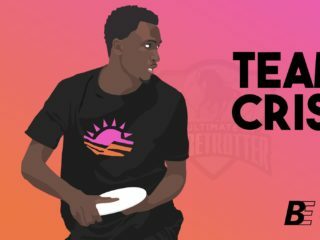 The subtext of the book is that ultimate is for real and is a damn fine sport, with a lot of upside and a great community, and a whole lot of talented and competitive athletes. SKYD: Are the snarky witticisms that appear in this book an accurate reflection on your views of the ultimate community? As should be asked of any satire, how do you think the 3rd edition reflects/criticizes/contributes to the ultimate community today? TL: I think I went a bit overboard in places criticizing the “spirit police.” That’s a bit outdated from the second edition and I should have corrected that more in the third edition. But I believe in almost all of the satire in the book, and the times I don’t are one-liners. My view on humanity is that we perpetually take ourselves too seriously (USAU), that we do dumb, craven, tactless things for money or fame (pro leagues), that Athletes are disloyal and greedy, Partiers are shameless, and Greenies are sanctimonious. But I truly, honestly, deep down (and on the surface) love USAU, the pro leagues—both of them—Athletes (I just had a child with one) Partiers and Greenies, along with everything else I make fun of in the book. I think ultimate-playing humans (myself included) are comical, nerdy, pedantic, disharmonious and bloviating but totally lovable. 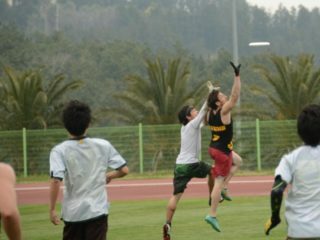 SKYD: How has writing about the ultimate community affected your playing/view of the sport and, vice-versa, how has playing ultimate affected your writing pursuits? TL: For years I felt like I wasn’t taken as seriously as a player because I was known as a writer. Looking back this was because I wasn’t a great player —even if I could dominate a pick-up game. The goal for me started to morph from making Nationals with an “elite” team to being able to compete at a tournament (and compete well) that I was also covering as a writer. I did that at Nationals twice, Paganello five times, Worlds, Beach Worlds, Lei-Out, Sandblast, Boracay and many more. TL: If the book could be any hat it would be the one I wore in college, a Minnesota Twins baseball cap that I wore so often it became faded, bent and worn. When a bad play happened or I threw a turnover, I would unconsciously spike the hat into the ground with great vigor, much to the amusement of my teammates and opponents alike. This book would make a great hat for spiking. SKYD: As someone who has been a part of the ultimate scene since, what, the 1960’s? and also as someone who has written down their observations of our quirky, pubescent sport, what are the biggest or best ways you’ve seen ultimate change? TL: Ok, I have three of them because I like threes. First was the Callahan Rules started by Charles Kerr in 1997 that brought the Observer system, capped games (which still badly needs tweaking), timekeeping between points, the Callahan goal and the Callahan award—all in one swoop. Second is the pro leagues. 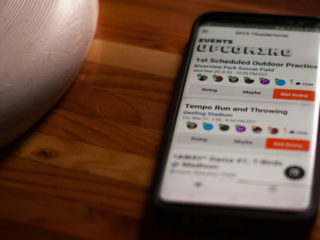 Many innovations and developments going on there finally prove—which many of us had theorized about but no one could actually prove—that ultimate can be taken seriously as a spectator sport. From a commercial perspective, a video/broadcast perspective (the sport can really look amazing at times), and a rules perspective, the pro leagues have been innovative and if you don’t innovate you die. Lastly, the push for the Olympics whereby it seems tangible now. I researched and wrote about ultimate’s quest for the Olympics in Ultimate: The First Four Decades and I was convinced it was unlikely to happen within my lifetime. But now it seems possible, which is remarkable. SKYD: Best three things going on the ultimate community today. Go. TL: Oops just did that one. But I’ll give you three more. 1) Broadcasting games live is awesome. 2) Skyd and Ultiworld are awesome. 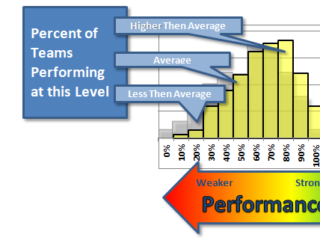 3) The fact that the sport is still growing at a rapid pace with tons of room for more growth is awesome. TL: 1) I don’t like the fight between MLU/AUDL and USAU. The different sides have been snipey. I get why—and there’s a lot at stake—but it’s unfortunate. It will change one day but right now it’s annoying. 2) The hard-capped/time-capped finals in USAU tournaments is terrible and needs to finally change. Those rules came from Kerr (see above) and he never wanted games to end the way they do now. No one does. They need to find a creative solution and when they do it will make ultimate even more exciting. 3) Not finding consistent ultimate or goaltimate in New Paltz, New York. SKYD: Last question. How in the world did you talk a publisher into initially printing this? TL: After Ultimate: The First Four Decades I knew I wanted to do another book. I had a few ideas but the one I liked the most was a “Top 50 Ultimate Tournaments of the World” coffee table book with a small description of each tournament and great photos. Imagine a cover shot of Kaimana Klassik for instance. A friend of mine in New York had a college classmate who was a book publisher. I met him and told him I had a book published and wanted to do another. He was interested but thought ultimate was too niche. But he put me in touch with Garth Battista and Breakaway Books. Garth seemed interested—apparently for years folks had told him he should publish an ultimate book but no one ever had one for him to publish. I pitched him the Top 50 Tournaments but he wondered why that couldn’t just be a web page. So I thought of some more ideas. I had used The Hipster Handbook as a guide to my sitcom pilot so I had a copy in my house. I thought it would be great template for a book about ultimate. I pitched that idea to him—a ten page proposal with sample chapters, some numbers about the potential ultimate audience, my bio and background as a writer, and so forth. He went for it! I signed and faxed (!) the contract to him and began writing. The advance came in the mail soon thereafter and I felt like I had just won the lottery. More accurately, a scratch-off ticket, but hey, I won!